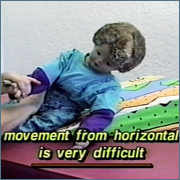 This video addresses the need for the physically challenged child to achieve transitional movements in and out of basic postural positions. Activating vestibular responses and righting reactions, variations in the use of supporting surfaces, and changes in the base of support are demonstrated as essential components in the sensorimotor process of learning and motor performance. Activities are demonstrated on a doll for clarity. Clinical application examples are demonstrated with children with various levels of disabilities.